The issue was that I had taken a large 846 inventory file that had 1000s and 1000s of rows and I just took the first 10 or 20 rows using a text editor. I just had to carefully adjust the value of SE01 from the huge number it was, down to the smaller number of segments that I actually had. However, sometimes, for no apparent reason, it won’t compile, or at least shows a “red dot” on the upper right corner of the expression shape, even though it is technically correct. Sometimes if you open it, and close it, or move it and move it back, then the error will go away. But this is a bug, and should not be required. YourOrchestrationName is the TypeName found in the Orchestration Properties. This has not caused the “stupid” problem of the compile errors and having to touch the shape, and move it. I deleted a BizTalk SendPort from the EDI agreement, but when trying to delete the same SendPort from the EDI Party, got the cryptic error: “Sequence contains no elements”. I had been doing a proof of concept with Role Links, and turned out that I still had the roles enlisted. I found that out when I tried to delete the SendPort in the application. So you have to unbind/unenlist the SendPort from the RoleLinks before removing the SendPort from the Party. The following Powershell function will add all files not yet added, then do a commit with the message provided in the call to the function, then do the push. The prerequisite is that the “GIT” command line is installed and available. I was earlier looking for an API, but I think this is the apparently the best way of accomplishing the commit. GitAddCommitPushDir $dirName "Test commit by Powershell Script"
System.InvalidCastException: Failed to convert parameter value from a String to a IEnumerable`1. [[System.Data.Common.DbDataRecord, System.Data, Version=4.0.0.0, Culture=neutral, PublicKeyToken=b77a5c561934e089]]’. We use SQL User-Defined-Types to pass XML data from BizTalk to SQL stored procs. I had to build a custom EDI schema to change the inbound validation for a field. In this particular project, the EDI pipeline had “Preserve Interchange” set to true. I knew there was a map in my project on this data, but the map itself used a special little schema that supported the “Preserve Interchange” format. So I think I might get lucky, and just be able to deploy the schema. Well – the map used XSLT, and the XSLT had the namespace of the schema. So although the map ran, it was generating a call to the stored proc that had no data, i.e. the User-Defined-Type didn’t get mapped under the root element. That caused the odd validation error above! In Summary – the namespace in the XSLT did not match the namespace specified in the Party/Agreement configuration. Thus the output of the map had a root element, but none of the User-Defined-Type elements. I needed a list of files from a huge directory of file for certain companies, and the company name was the prefix of the filename. The company names are added to an array of strings. This script recursively gets all filenames in a given directory, tests them to see if the start with any of the given prefixes, then writes to the console and to a given filename. Note: You could also use $file.FullName to get the entire file name including the directory. $file.BaseName is the file name without the directory and without the extension. $file.Name is the file name without the directory (but with the extension). If your filenames don’t have names like mine: CompanyName_text_text_text.txt, then you could do two loops. One to loop through the prefixes and then to and use the C# string.StartsWith method to see if the file starts with that prefix. (Or instead of a prefix, maybe your search terms could be anywhere in the filename, use the C# string.IndexOf). What caused the error for me was that I in the SettingsFileGenerator.xml spreadsheet, I had renamed all the “Settings File Names” for each environment. I switched the “Local Development” back to Exported_LocalSettings.xml and this got around the issue. Perhaps there is a setting in the .btdfproj file that allows you to specify (override) the local settings name, but I couldn’t find it today. I don’t have the total solution, but the problem was that I had an EDI210 standard schema and an EDI210 custom schema. When the custom schema was added as a reference at the same time as the standard one, then this error occurs on all XML Validation pipeline components in the project. Apparently some properties overlap. Document namespace is a combination of name and assembly of the schema, separate by a comma (and a space). Step-2. 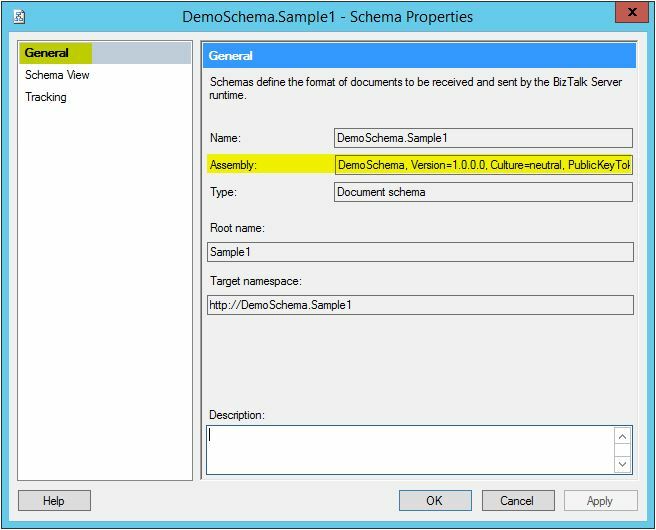 Double click on the schema for which you want the Document Spec Name; you will find “General” tab on the left hand side of the window. Step-3. On this General tab, “Name”, “Assembly” and “Type” would be listed, read-only, but you can copy-paste from them. Above steps taken from https://stackoverflow.com/questions/12319987/documentspecnames and elaborated a little. NOTE: You can also get the Target Namespace from this screen. If you want to filter on a message by MessageType, use the pattern namespace#rootElement.